I think many would agree with me when I assert that the New York Times is more than just a newspaper. As a native New Yorker, more than being my local source of news, it’s been a source of informal, lifelong learning: an educational source that has been with me throughout all stages of life, on the medium of my choice. In a digital age when newspapers and other print media can barely stay afloat, the New York Times has flourished. We could all learn a thing or two about education, about business, and about adaptability from the New York Times. Last week, the Times building opened its Renzo Piano designed doors to educators from across the country for the inaugural Schools for Tomorrow conference on bringing technology into the classroom. Central to the day’s discussion was the role of the teacher in the midst of widespread technology enthusiasm and implementation. What will teaching look like in the schools of tomorrow? For starters, several panelists voiced that we must avoid false dichotomies. Technology will by no means replace teachers, and asking whether students learn from teachers or technology is misguided. In the schools of tomorrow, students will learn from both, teachers and technology (among other sources). As Harri Skog, Permanent Secretary, Ministry of Education, Finland eloquently said, “Technology is a good servant but not a good master. It cannot replace human interaction”. This notion human “irreplaceably” is supported by a growing body of mind, brain, and education research that emphasizes the affective and cognitive underpinnings of learning. There was general agreement in the room that while the role of the teacher changes with technology-facilitated education, the teaching profession becomes more important, more professionalized, and more challenging than ever before. Rather than assuming the role of content-delivery, teachers can potentially spend more time on the things that really matter, like helping individual students craft their own learning. “Asking how technology can improve education is the wrong question. It’s like asking how a refrigerator can help me become a better cook”. – Tracy Gray, Managing Director, American Institutes for Research. Too often, conversations surrounding technology and education are exceedingly general. We don’t need general conversations, we need specificity. Hand in hand with specificity is alignment. Giving a teacher a general tool with lots of bells and whistles is dandy, but if it doesn’t fit in directly with the curriculum, it’s not so useful. Conversations must shift to specific uses of technology in the classroom and how these uses align with school curricula and standards. The importance of alignment is relevant not only to classroom-level technology implementations, but system-level technology implementations. Without alignment and specificity, scaling up becomes an even greater challenge. 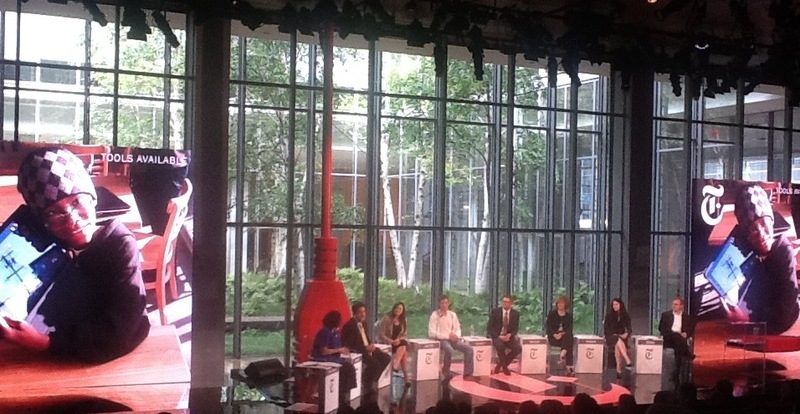 “The school of tomorrow is an experience, not a place”. With the emergence of digital technologies comes the ability to learn anywhere, anytime, anyplace. Students’ access to educational content is no longer limited to school hours or school spaces. While the focus of the conference was on formal education systems, informal learning was inevitably mentioned throughout the conference. One can’t help but wonder: Can informal learning help make formal education more relevant? Can informal learning help maximize classroom time? This topic warrants a conference of its own, but I was happy to see this relationship between formal and informal learning touched upon. Technology changes a lot of things, but what does it not change? Horn Mun Cheah, Director of Educational Technology, Singapore, expressed this beautifully when he reminded us that we mustn’t forget about the “evergreens”: the aspects of our educational ecosystem that have always been, and will always be, relevant. This is a critically important point. There are certain aspects of education that are timeless, irrespective of technological innovations or pedagogical shifts. These include discernment, critical thinking, character education, study skills, the physical world, and ethics, to name a few. A system that fails to include these essential traits fails to adequately prepare students to live in the world. This is a good thing. One could not help but notice an underlying tone of skepticism, and even cynicism, throughout the New York Times’ first conference on bringing technology into the classroom. Indeed, there are many open and sobering questions that still remain unanswered. Nevertheless, whether we like it or not, we cannot turn back the clock; technology in education is here to stay. Policy makers are no longer asking if we should use technology in education, but how we can use technology in education. I applaud the New York Times for broaching this important topic. Improving the relevance and quality of education is a colossal challenge, and cross-sector collaboration is a great place to start. The rhetoric is everywhere: technology has the potential to improve education. Sentences using the words “technology” “potential” and “education” have been uttered for decades, in different languages, in different settings. Talking about the potential of technology in education has become second nature to those of us in the field, and maybe even trite. However, I’ve noticed an important shift: The conversation has moved beyond speaking merely about the potential of technology. Now, conversations seem to start with “Well… [long pause. foot tapping. stern glance] …now what?” In other words, “Where is the data?”. We’ve convinced those that need convincing: policy-makers, funders, administrators, parents… Governments of developed and developing countries have invested tremendous sums of money in educational technology, with the hope that it will alleviate the educational, social, and economic problems that plague their societies. Educational technology projects are becoming increasingly accepted. This is good news. But the expectations of these project might be more than we can comfortably meet. Not to mention, we seem to have less data backing us up than we thought. Until more educational and pro-social children’s media gets picked up by other networks, we need PBS KIDS. Desperately.The house eliminated funding for public broadcasting. You can help by joining 170 million Americans for Public Broadcasting. Paula Kerger, President and CEO of PBS, wrote an article in the Huffington Post today. Everything below is a quote from her. “PBS member stations are America’s largest classroom, available to all of America’s children — including those who cannot attend preschool. And a growing body of research shows that public television programs help children learn more effectively, starting from a very young age. 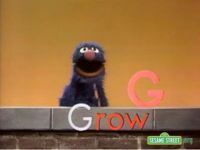 For example, a study entitled G Is for Growing found that children who watched Sesame Street in preschool spend more time reading for fun in high school, and they obtain higher grades in English, math, and science. A study conducted by Shelley Pasnik of Education Development Center and William Penuel of SRI International showed that preschool children who participated in a curriculum incorporating PBS KIDS video and games into classroom instruction were better prepared for kindergarten than those who didn’t. Independent research also demonstrates that PBS multimedia content is accelerating learning for kids and closing the achievement gap. Recent research reveals that kids who played with the PBS Martha Speaks app made significant gains, increasing vocabulary as much as 31 percent in a two week period. Six solar panels have been fitted on the roof enough to provide 12 hours worth of electricity everyday. The panels will last up to 25 years. The container can be placed and used anywhere on the planet, with no mains electricity or wired connectivity needed. To function it only requires power from the sun and the internet access is acquired through cellular data connection, wifi or VSAT. According to Dr Tom Musili, Executive Director of the Kenyan based charity CFSK, “the solar internet cafe will provide ICT solutions to schools and community centres in the areas of Kenya that don’t have mains electricity or any form of physical infrastructure to drive development”. He is optimistic that after the launch, which will include loading the container on a truck, it will enable them to reach community centres in the remote areas of Garissa, Wajir and Moyale. Dr Musili would also like to see this initiative duplicated in the rural areas of Neri, Taraka and Mingi. More about this exciting project can be found on Computer Aid’s website. Images of the mobile cafe are available here. I’ve been asked numerous times what my philosophy is on educational technology. I hesitate to write about personal views, as they can and do change over time. Years from now, will I look back on this post and still agree with what I’m writing today? I’m not sure. But that is part of what excites me: the ever-changing view on life, on education, on the human mind, and on technology. So to that question: What is your philosophy on educational technology? First and foremost, I am an educator. Give me a pencil, an iPad, a fancy custom LMS, a stick and some dirt. I will educate. Education first, medium closely second. Technology platforms provide us with immense affordances. If I didn’t believe in the value of these affordances, I would not do what I do with such passion. But at the forefront is the educational value of the technology initiative that I am pursuing. Aesthetics and usability matter. If you are learning to read, the words should be legible. If you are navigating a website, the interface should facilitate. Technology can, and should, facilitate learning. 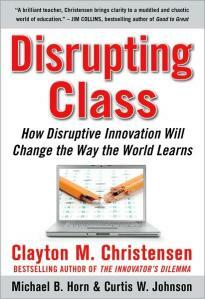 In a recent a rticle published on Forbes.com, Clay Christensen and Michael Horn, authors of Disrupting Class: How Disruptive Innovation Will Change the Way the World Learns summarize their beliefs. With public funding for educational dwindling and the imminent mass-retiring of the baby-boomer generation, the future of education lies in for-profit, online education. Read the full article here.